I have noticed that lately my blog has focused on Lebanese food. I don’t know why especially. The fact that I am Lebanese might have something to do with it, but I live in bicultural home were we live on a multicultural diet, as is befitting for a Sydney lifestyle. In my little corner of the world I can eat anything from ayam goreng to zabaglione, and I do. But lately, I often think of home. I miss my little village, our olive trees anxious for the summer time, and my parents who are waiting for that weekly phone call from their three boys who are scattered around the world. I find some solace in that phone call, and I spend hours talking to my mom, discussing day-to-day life, sharing worries and triumphs and swapping recipes. Easter is near, and normally I would have felt it approaching. You see, though Sydney has given me so much, it has also made me a stranger to traditions I used to identify with. That’s what nine years does to a migrant. In the period of Lent leading up to Easter Sunday, I would have been more aware of the approach of Easter, possibly because I usually would have had a lot of kibbet la’teen. The days of Lent traditionally meant abstinence from meat. This has now changed, but in keeping with tradition, I wanted to make kibbet la’teen, or pumpkin kibbeh. Kibbeh is the national dish of Lebanon and we have so many variations on the theme. The most famous is the torpedo shaped balls filled with minced meat and pine nuts. Any decent or even terrible Lebanese restaurant would have kibbeh on the menu. 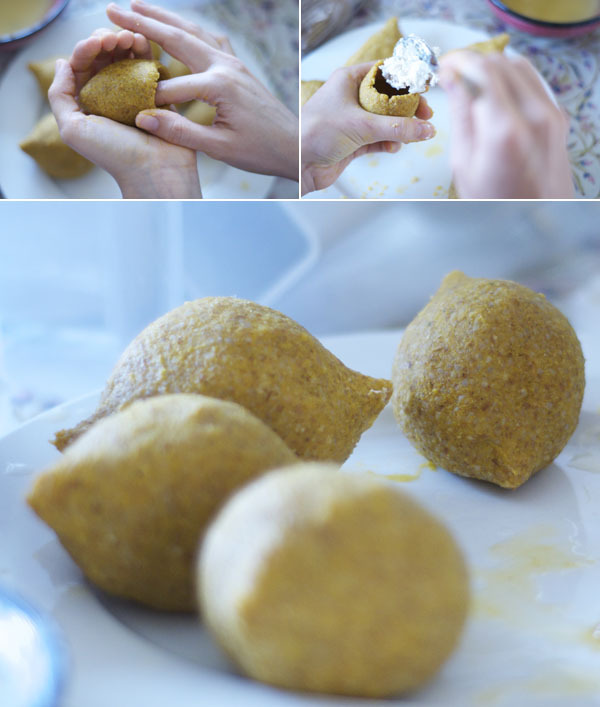 But pumpkin kibbeh is the only kibbeh to have during Lent. I love the regional name kibbet heeleh. This names translates to “trick kibbeh”, the trick is, of course, the sneaky substitution of meat with pumpkin. The filling varies, and you can use anything. You would normally fill the little kibbeh balls with silver beet or spinach, fennel, raisins, chickpeas and onions. Another filling would be labneh (a creamy spread made by straining yoghurt) with onions and dried mint. I decided to go with the labneh filling and I also made a filling with fetta and walnuts, which turned out great. I got this recipe from yet another weekly phone call to the folks back home. Mom emphasised that I MUST squeeze the pumpkin after boiling. So please, do as Mom says. It doesn’t have to be perfect, as long as it holds the filling. It gets better the more you do it. When the kibbeh is around the length of your index, place the filling of choice inside and close it up by either rounding the edges or flattening them. Now to cook them, you can either bake, deep-fry or boil them. Deep-frying is the tastiest but least healthy, which is of course what I did. You want the colour to deepen to a nice dark brown. If boiling, do so for around 5 minutes. The colour will not go brown, but they will be cooked. Eat hot or cold. It doesn’t matter, as long as you eat them. Enjoy, and if I don’t see you, Happy Easter. That kibbeh la’teen is superb! I could tell from the color! 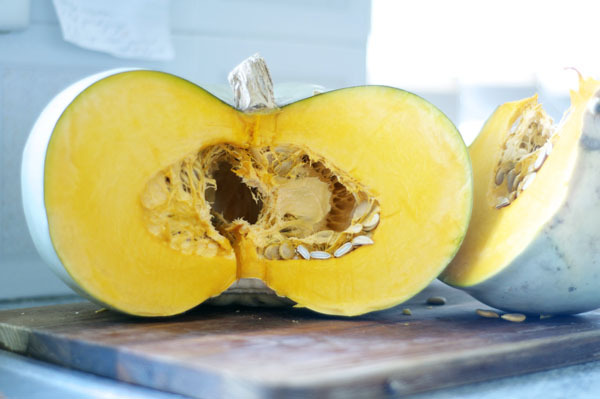 You put plenty of pumpkin; you know when i made them they tasted almost sweet! I love them so much! 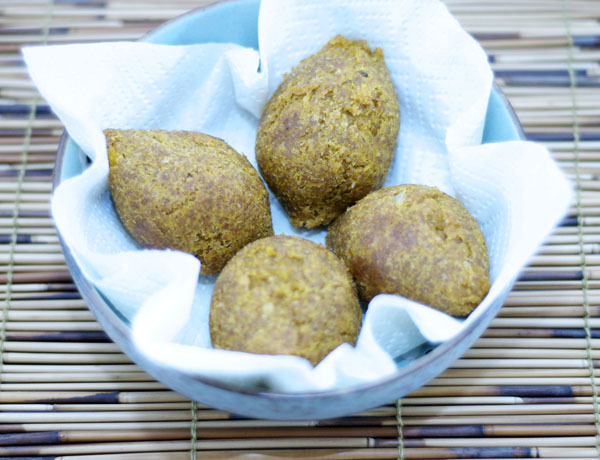 I have noticed a lot more vegan kibbeh lately, like one made only with bulgur but i think the pumpkin one is the best; the fillings are great too! I have had this last week! This is one of my favorite stuff to eat. We fill it with Chickpeas, chard, onions and sumac. We had some filled with plain labneh. I like the dried mint idea and onions with Labneh, will tell my mom to make it that way next time. This is one of the best things to eat really. I LOVE IT! Joumana – It does taste sweet, doesn’t it. I agree. I think pumpkin kibbeh is even better than meat kibbeh. Viviane – great filling choice with the chard. I was busy making 3 other dishes that day so opted for a quick and easy labneh. It is a traditional filling though, and is quite popular in Lebanon. The fetta and walnut is a bit of an invention but works nicely too. If my background wasn’t complex enough, I have become vegetarian and vegan and have been adapting recipes ever since. I’ve tried all manner of potato and pumpkin kibbes since but have been looking for a recipe that wil allow me to make the little balls, instead of filling out a baking dish. 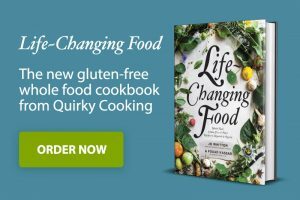 This recipe IS AMAZING and I am SO trying this out. My mother has a fantastic oven baked vegan kipe recipe that I will kindly share with you as soon as she shows me how to do it (we’ve schedule a ‘cookout’ for next month). This looks divine, I will be trying it very soon when I have friends over. Your photography is beautiful too! Lazy_Ducky – You’re right, they are great boiled too (or baked even). I’ve never had them with vermicelli rice though. That’s usually something we have with the meat kibbe that is cooked in yoghurt (kibbe b’laban). Oh my, I had no idea there was a vegetarian version of kibbeh. I will have to try this once I get the chance. My mom isn’t a fan of kibbeh balls but we’ll see if this changes her mind. .-= Viviane´s last blog ..Wild Rice Jambalaya with Turkey Kielbasa =-. looks great… I dont squeeze mine, just put them on a fine strainer.. we need some juice to soak the burghul, other wise they will be dry… and you need to work fast when its still warm to mix well and combine with the burghul , then leave to rest…. You did a great job and I can see that you are listening to your mom…. By the way, I had a friend at school also from Kassab family, and begining of the war, they left Mousseitbeh… and never heard about him again. .-= Forage´s last blog ..Lentil koftas with roasted salsa =-.